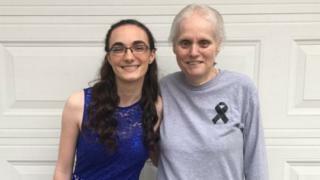 A teenager has shared a heartbreaking letter her mum wrote to her before she died, and the words are resonating with thousands of people across social media.Peggy Summers wrote letters for her 18-year-old daughter Hannah and each of her siblings before she passed away of stage 4 kidney cancer in Indiana. Hannah's letter, which contains advice on school and relationships, has been shared on Twitter more than 90,000 times as the words reverberate with strangers across the globe. The emotional letter begins: "Hannah, if you are reading this then the surgery did not go well. I'm sorry, I tried my best to beat this terrible disease but I guess God had other things for me to do." The letter has advice for Hannah about school, boys, and her relationship with her dad: "Be patient with dad, this is going to be hard on him and he will need time." "You will both need to lean on each other and talk a lot which is not one of our strong points but try and don't give up. "At the end of the letter Peggy tells her daughter: "Tell everyone you love them as often as you can. "Enjoy life and live each day as if it is your last because none of us know if today will be the last. And most of all remember that I love you more than you will ever know." Hannah told the BBC: "Reading the letter was so hard. We all read them on the night that Mom passed, so it was a very emotional experience. "Even though it was so hard, it also brought me a lot of comfort. Her words helped me realise that no matter how hard this whole situation is going to be, she will always be with me. "Thousands of people have reacted to Peggy's heartbreaking words of wisdom for her daughter. One Facebook one user posted: "I lost my dad around a year ago, he didn't leave behind any last words or letter but I'd like to imagine he would have written something like this." On Twitter one user wrote: "My mom passed also and she wrote me a letter exactly a year before just 'in case.' I treasure it daily. So sorry for your loss, stay strong. "While another posted: " I lost my mom 2004. This is the truth! Hug them love them while they are here."